For $29, you get one month of classes, including the initiation fee, with four complimentary open-gym passes (up to a $114 value). For $39, you get one month of classes, including the initiation fee, with four complimentary open-gym passes and $20 in retail credit toward toys (up to a $134 value). Experienced instructors at Gymboree Play and Music Center caper about with kiddies, from newborns to 5-year-olds, stimulating young minds in Play and Learn, music, art, sports, and school-skills classes. Along with the included four open-gym passes, parents choose one course that runs weekly over the course of the one-month membership. Tiny all-stars gambol around, kicking soccer balls and dribbling basketballs in the sports class, which buffs up motor skills with controlled movements and stretches while teaching kids how to confidently stammer gibberish in the presence of sports reporters. Tots can delve into creative pursuits, sculpting, painting, and collaging in hands-on art classes, or learn to socialize and cooperate in school-skills classes. With a variety of sonic styles, music classes emphasize rhythm and pitch, leading mini Mozarts through exercises such as singing, dancing, and stage diving into a crowd of stuffed animals. Groupon buyers also receive a complimentary play tunnel on the second month of their membership if they continue their enrollment. Groupon customers with $20 in retail credit can stock their tot's playroom with fun, nontoxic, and educational toys that fortify the developmental skills they learn in classes. Imagination junkies can form their own junior blues band with a harmonica ($9), wave drum ($16), and microphone ($3), or coerce a Gymbo the Clown hand puppet ($12) to finish their math homework for them. 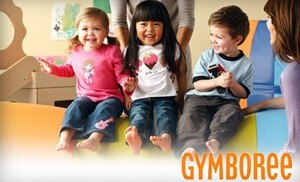 Though Gymboree Play & Music sometimes features a discounted price online, this Groupon still offers the best deal available. Visit the Groupon ATL website to see this and all the other fantastic Groupon ATL and national deals!